O’FALLON, Missouri — Unranked Fatima took on No. 1 Springfield Catholic in a Class 3 baseball semifinal Tuesday, and the rankings held. After trailing by a wide margin the majority of the game, the Comets made a push in the final two innings. In the top of the seventh, Hunter Hennier represented the go-ahead run when he ended the game by flying out to the warning track in center field. If his line drive had landed, Fatima would have erased the lead of the Fightin’ Irish. “When he first hit it, I thought we tied the ballgame, honestly,” Fatima coach Scott Kilgore said. Instead, Springfield Catholic secured a 6-4 win, denying the Comets a chance to defend their Class 3 state title. After getting its first run in the sixth, Fatima headed to its final at-bat trailing 6-1. The Comets made things exciting when Sam Hager singled and No. 9 hitter Jared Schulte tripled to turn over the lineup. Leadoff man Logan Vogel then doubled down the right field line to cut the lead to 6-3. Springfield Catholic then pulled starter Matt Tipton after he threw a wild pitch that allowed Vogel to move to third. Fick singled, driving in Vogel, and advanced on an error. Reid Kesel was hit by a pitch, and Hennier represented the go-ahead run. The Comets attempted to hit-and-run, but Hennier’s drive never hit the ground. Springfield Catholic took the lead early, scoring a run in the first despite going hitless. Brayton Ballenger walked to begin the inning and advanced on an error. Ryan Haller had a sacrifice bunt before Eric Atwell had a sacrifice fly to score the game’s first run. The Fightin’ Irish widened their lead in the second, plating four runners on one error, three hits and one walk. Kesel started the game on the mound for the Comets but was pulled after 11/3 innings, allowing five runs, two of them earned. “I think he was just struggling a little bit with the strike zone,” Kilgore said. “But like I told him, we’ve got to focus on things we can control, and we’re not in control of that. That’s out of our control. Alex Dickneite came in from left field in relief and pitched the remaining 42/3 innings, allowing only one run on one hit. The junior struck out six. Springfield Catholic scored its only run off Dickneite in the fifth. Ballenger was hit by a pitch and then advanced to third on a stolen base that led to a throwing error. Haller drove him in with a single. 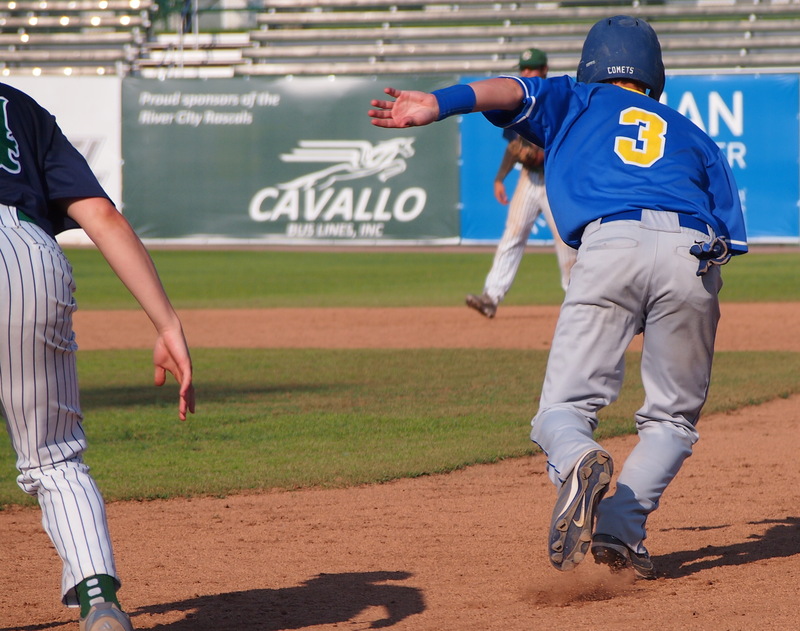 Fatima responded in the top of the sixth with its first run of the game. John Fick began the inning with a double, Will Robertson singled, and Fick scored when Kesel hit into a double play. Tipton picked up the win, throwing 95 pitches in 61/3 innings, allowing four earned runs and striking out eight. Tyler Ast recorded the save. The two teams also met in last year’s Final Four. Springfield Catholic was the runner-up as Fatima clinched a state championship with a 2-0 win in extra innings. O’Fallon Christan defeated New Madrid County Central 4-3 in Tuesday night’s second semifinal. Fatima will play New Madrid County Central for third place at 10:30 a.m. today. “If we can take the momentum that we just established right there into (today), I think it’s going to be a great outcome,” Kilgore said.